Day 1Arrive in ChennaiOn arrival at Chennai airport meet with Pink Mountain Treks and Expedition's trptrsentative and transfer to hotel. Overnight at hotel in Chennai. Day 2Chennai – KanchipuramAfter breakfast, half day city tour of Chennai. First visit the Museum to see the art and bronze gallery. Drive through the Flower & Fruit Market, High Court, Fort Museum, Marina Beach, Saint Thomas Cathedral. Then drive to Kanchipuram, the temple town. Arrive and check into the hotel. Then visit the most famous Siva temple at Kanchipuram, the Ekambareswara temple. The dimensions of this temple are reflected in its 20 acre spread and its tall south gopuram, which soars to a height of 58.5m. Also visit Kailasnathar Temple is built by the Pallava Dynasty during the first quarter of the eighth century. Overnight stay in hotel in Kanchipuram. Day 3Kanchipuram – Bangalore After breakfast, drive to Garden city of Bangalore. Arrive and check into the hotel. Rest of the day is at leisure or visit MG road to explore the main market of Bangalore. Day 4Bangalore – Mysore After breakfast visit Bangalore city. You will visit Lal Bagh, where the garden extends lush green paradise with an area of 240 acres in the heart of the city. Nearly 673 general and 1,854 species of plants are found in Lal Bagh. Then drive past Vidhana Soudha, the state assembly. Finally visit Bangalore Palace. Wodeyar King in 1887 on the 400 acre space. Inspired by the Windsor castle, this palace was built in the Tudor style, complete with Gothic windows, foiled windows, battlements and turrets resembling the Daria Daulat Palace in Srirangapatana. Drive to Mysore in the afternoon. Arrive and check into the hotel. Evening free. Day 5Mysore After breakfast, visit Mysore city. First we will visit Chamundi Hills on the outskirts of Mysore city, then visit the temple and Nandi (Bull) statue made of one block of stone. Return to the city and visit Mysore Palace. It is an excellent combination of Dravidian, Indo-Saracenic, Oriental and Roman styles of architecture. The Maharaja's Palace is a beautiful three storied stone building of fine gray granite and rich pink marble domes, overlooking this structure is a five-storied 145 foot tower whose domes are gilded in gold. In the evening you will visit Devraja fruits and flower market. Overnight in the hotel. Day 6Mysore – Ooty After breakfast drive to the hill station of Ooty. Arrive and check into your hotel. Later visit the botanical garden. You can also visit Doddabetta pass to have a splendid view of the hills and tea plantations. Overnight in the hotel. Day 7Ooty – CochinDrive to Cochin. Arrive and check into the hotel. In the evening attend Kathakali dance show. Overnight stay at your hotel in Cochin. Day 8Cochin – Alleppey After breakfast visit Cochin including The Dutch Palace at Mattancherry, renowned for its wall murals depicting scenes from the Ramayana. The Jewish Synagogue at the heart of what is locally called the Jew Town. The St. Francis Church, the oldest European church in India. Later transfer to Alleppey. 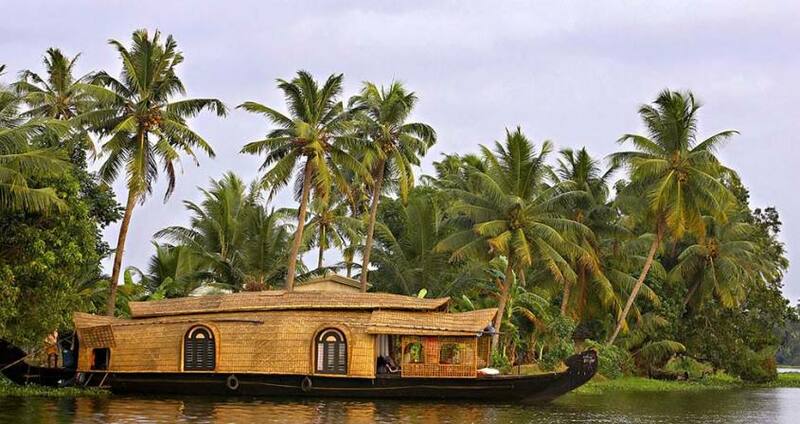 In the afternoon check in to a traditional Kerala house boat for a cruise, which is totally a delightful experience. Cruise through the palm fringed canals, watch the paddy fields and village folk, while relaxing on board hearing the lullaby of the wind & waves. This mysterious strip of emerald green land is packed with endless miles of placid backwaters that appends to its charm. Freshly cooked local food is served onboard. Continue cruising in the lake. Observe the daily life of people who live near the lake. Dinner and overnight on the houseboat. Day 9Alleppey – Periyar Breakfast on the houseboat. Then drive to Periyar. Arrive and check in to the hotel. Then you will be taken to visit a plantation garden where you can see all types of spices. In the afternoon an elephant ride for 30 minutes in the plantations. Rest of the day is free at your leisure, or you can enjoy a body message at an Ayurvedic centre. Overnight at the hotel in Periyar. Day 10Periyar – Madurai In the morning take boat ride in the Lake Periyar to watch animals in their natural habitat on the water's edge. While cruising on Lake Periyar, you are likely to see animals like wild boars, sambars, wild dogs, Langur monkeys and wild elephants. Then drive to Madurai. Arrive and check into the hotel. Overnight at the hotel in Madurai. Day 11MaduraiBreakfast at the hotel visit Madurai city. Visit the Meenakshi Temple, which is 1000 pillared hall carrying some beautiful sculptures of the seventeenth century. Also visit Thirumalai Nayak Palace. This Palace was built in 1636 by King Thirumalai Nayak with the help of an Italian architect. The building we see today was the main palace where the king lived. The original palace complex was four times bigger than the present structure. This palace consisted mainly of two parts, namely Swargavilasa and Rangavilasa. Also visit Gandhi museum. Rest of the day free at leisure. Overnight stay at hotel in Madurai. Day 12Madurai – TanjoreBreakfast at the hotel and drive to Tanjore. Arrive and check into the hotel. Then visit Brihadeeswarar Shiva Temple at Tanjore, built by King Raja Rajan from the year 985 AD - 1010 AD. This is one of the superb temple architects of the Chola dynasty. Later visit Raja Rajan art gallery to see bronze statues of 9th-16th century. Overnight stay at your hotel in Tanjore. Day 13Tanjore – Chidambaram – Pondicherry After breakfast drive to Pondicherry. On the way visit The Nataraja Temple at Chidambaram. The roof of the sanctum sanctorum is covered with gold plates. The presiding deity of the temple is represented by air, one of the five elements of the universe and is known as Akasa Lingam. Continue driving towards Pondicherry. Arrive and check into the hotel. Overnight at your hotel in Pondicherry. Day 14Pondicherry – Mahabalipuram – Chennai After breakfast visit Pondicherry. Visit the city and Sri Aurobindo Ashram the serene world of distinct spiritual vibration and thus renowned as Sacred Land. Also visit Auroville. Continue drive towards Mahabalipuram. Visit the 7th-century Shore Templewhich is surrounded by lush gardens. Later visit the 7th-century Five Rathas. After the visit drive to Chennai. Directly transfer to airport to board the flight for your home country. (Depending on your flight schedule, one last night stay can also be arranged).